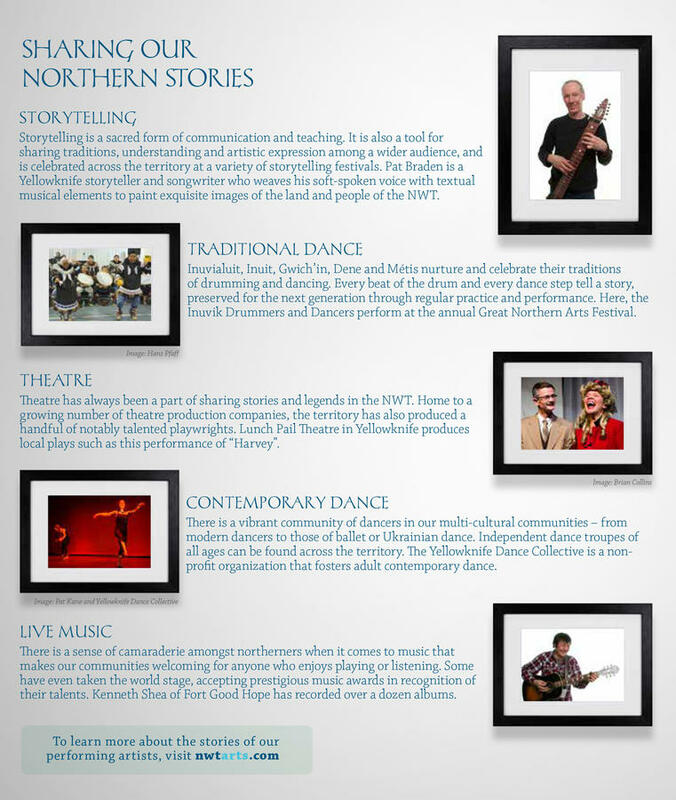 The diverse population of the Northwest Territories (NWT) fosters performing artists of all disciplines to work in collaboration, sharing their cultures and merging their talents to create unique performances. In the Dene tradition, drum songs and prayers mark the opening and closing of special events. Traditional Dene drums are played by a group of men, who sing to a rhythmic beat. The Dene drum is made from a 60 cm (24”) birch frame covered by a stretched caribou hide attached with babiche (sinew). Three strands of babiche stretched across the face of the drum make a buzzing or rustling sound when the drum is struck with a 30 cm (12”) drumstick or peeled birch. Inuvialuit and Inuit drums and songs are quite different from the Dene tradition. Often there is a single drummer, singing his own song, accompanied by a chorus. Inuit caribou hide drums are sometimes over a metre (39”) in diameter. The drummer holds the drum high in the air by a handle and rotates it to bring alternate sides of the rim into contact with a wooden beater. American and European traders introduced jigs and reels played on the fiddle to First Nations people in the early-1800s. Today, almost every community in the NWT has a novice or veteran fiddler who lights up the community hall most weekends much to the delight of residents who cannot resist the urge to jig. The NWT is home to many musical styles inspired by its multicultural residents. Music programs in schools across the territory are well attended and students are encouraged to express themselves through music, dance and theatre. Music flourishes throughout the summer when outdoor festivals are held under the midnight sun. The largest and longest running music festival is Folk on the Rocks, held overlooking Long Lake on the outskirts of Yellowknife every third weekend of July. There is also the Open Sky Festival (Fort Simpson), South Slave Friendship Festival (Fort Smith) and the Midway Lake Festival (Fort McPherson). All four festivals feature local, territorial and national talent, and typically include visual artists, storytellers, filmmakers, food vendors and much more! Dene communities still hold traditional tea dances and drum dances to celebrate special occasions. In a tea dance, men and women stand side-by-side in a circle facing inward and move to the rhythm in a clockwise direction. At a drum dance, the dancers follow one another in a huge circle moving clockwise. The dance finishes when the lead drummer performs a drum roll and sings louder in a final crescendo. Inuvialuit from the Mackenzie Delta perform traditional dances in custom-made dance costumes decorated with fur, feathers and signature delta braid. Dancers act out traditional stories that tell of hunting, of good times and hard times. The introduction of fiddle music also encouraged jigs, reels and square dancing. Metis dance troupes hold the floor with demonstrations of skill and dexterity. Northern jigs are variations of one of two dances: the “Red River Jig” or the “Varandii”. The latter is a version of the Scottish country-dance called “Drops of Brandy”, also known as “Le Brandy” in French-speaking Canada. Today, all forms of dance in the NWT are rich and flourishing. Yellowknife is home to Bella Dance Academy, which teaches dance to children and youth, and the Yellowknife Dance Collective, which fosters adult contemporary dance and performances. The Northern Arts and Cultural Centre (NACC) in the capital city of Yellowknife, is a 297-seat theatre, and provides a professional venue for local and visiting performers alike. In the smaller communities, festivals and events that celebrate the seasons would not be complete without the excitement and fun of local music and dancing. The Centre also supports educational and community workshop programs throughout the NWT. NACC has an active performing artist mentorship designed to strengthen and encourage the professional development of select performing artists in the NWT.